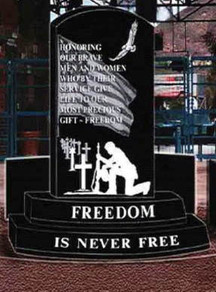 LOS ANGELES — A federal judge in California has ruled that a veterans monument that includes the symbol of the cross is an unconstitutional endorsement of Christianity. As previously reported, the city council of Lake Elsinore unanimously approved the creation of the monument in November 2012, which was to be erected in Diamond Stadium. The 5-0 vote followed a public hearing where over 100 residents attended to voice their opinion, mainly in support of the display. However, the 6-foot granite monument was met with disapproval by atheist groups and others who asserted that one aspect of its design went too far. The monument, which declares, “In honor of our brave men and women who by their service give life to our most precious gift — freedom,” also depicts a soldier kneeling before a row of cemetery markers in the shape of a cross. A star of David is also featured on the display, as well as an American flag and a soaring eagle. In a lawsuit filed by the American Humanist Association (AHA) on behalf of residents Diana Hansen and John Larsen, the organization contended that the crosses on the monument clearly were representative of Christianity and therefore were inappropriate for a public memorial. Last July, U.S. District Judge Stephen Wilson agreed with the atheist association and issued a temporary injunction against its installment. On Tuesday, Wilson issued his final ruling in the matter, finding the monument to be unconstitutional. AHA applauded the ruling, stating that it believed the monument needed to be more inclusive of all Americans. But the city said that it would review the ruling as it disagreed with the outcome of the case. The city has not yet stated whether it plans to appeal, although it may do so within 30 days.